Ok - nothing significant to report rgerading gains or losses. Goal for March - no specific number, $2000 would be nice, but will be happy with consistent good practice rather than a number. Also will attempt to be a lot more picky (conservative) in number of trades, in otherwords try and do fewer but more successful ones. Demo account is also doing allright. No losses and small gains. I think thats at around $20 000. Uncertain times with possible conflict in Ukraine, though hopefully not, but markets seem to react in odd ways to things. Anyway- now find myself feeling as if the US dollar could go up or down, feels a bit middle ground. Of course it can always move up or down, its just that now I feel as if it is in middle ground, and I am not keen on “feeling” anything. Am only keen on following the strategy. For the time being then since I dont know what to do, I will do nothing. Or alternatively - revert to rule 1, If i do feel like doing something, then it better be in a situation where I can get my stop loss into positive in less than a minute. so only during a strong rise or fall. Hmmm, well some large rises in the $US. Would have made a bit there if i had tradedthat way, but I wasnt. In fact I would have thought such a move quite unlikely. so still at $1309 and not trading while I try and see how high the dollar is going. The range for the last year is about 97yen to 105yen to the dollar, so now at 103 not far off the high, but still feel as much chance of more rise as of fall? Messed up in my demo account by trading against the trend, which would make me think to trade with the trend, but it may be ready to turn now? so lets say Im practicing patience. I was reading through your log and thinking, could have been a blessing in disguise not buying the USD with whats going on at the moment in the world. Call me paranoid, im only selling USD EUR atm - if anything. Dollar all over the place,a nd with the US sending warships to the Crimea im guessing market sentiment will be up and down and all over. Yes, cant say I’m thinking to buy US, so really just waiting for the best point to sell. Still not impossible to go higher yet. Now after a weekend - this chart shows the price activity much sooner than my trading platform opens for trading. so in this case, there is a fair drop after (or during the weekend) and then it rose again, and i would not even have seen this price activity if I only viewed the chart in Oanda. Whats up here, can someone explain this to me. How is it possible that this chart I gave the link to - becomes active about 2 hourse before Oanda. so for instance the red arrow at the left shows where the chart became active after the weekend (on this chart) and the red arrow at right shows where Oanda would roughly have opened trading. 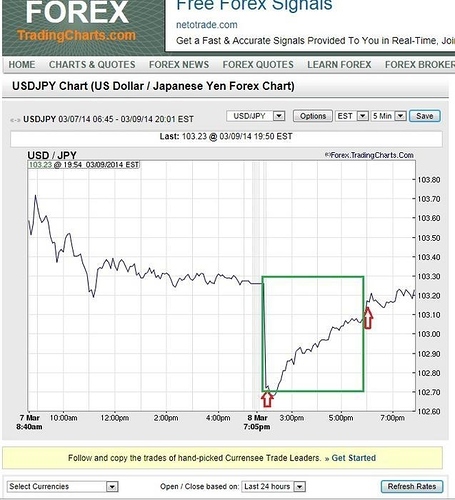 the green box sort of shows “advance notice” information which you could use to trade?? and why is there this difference. Surely weekend trading is the same across all charts and platforms - obviously not? There is always a positive or negative on monday mornings as you said due to fundamentals over the weekend. Perhaps change to Mt4 ? slight gains - painfully slow, but happy with the risk management. balance $1324, so up about$15. Oh dear - would have made a good bit with that drop in the US dollar, but I just happened not to have trades in. Probably would have made $100. Anyway - there will forever be missed opportunities. Kudos to you for learning that psychology is one of the most important sides of trading. Most people would say that it is about 80% psychological. Keeping a log is an excellent idea in that it allows you to track your mistakes. I am a professional trader and when I was in training the first thing they told us to do was keep a detailed trading journal. Most of the good traders on the trading floor where I work keep very detailed trading journals and there seems to be a correlation between a well kept trading journal and profits. Make sure that you also take the time to go back and read your trading journal or else it is almost no good. Another trick that I adopted was making a list or a bunch of sticky notes and putting them at your trading desk. This will make you read them over and over again. Write a list of the rules of trading on them. Consider your losses as tuition payments to attend the school of Wall Street. When you are starting out you can learn from every loss and every win so pay close attention and you’ll pick it up faster than others. Yes - the costs of the school are high, and yes I have realised that despite all sorts of charts, strategies, news, analysis, the more overwhelming effect is psychology. Current balance $1425. slight gains again. This time a very odd thing happened. I missed out on a great opportunity. 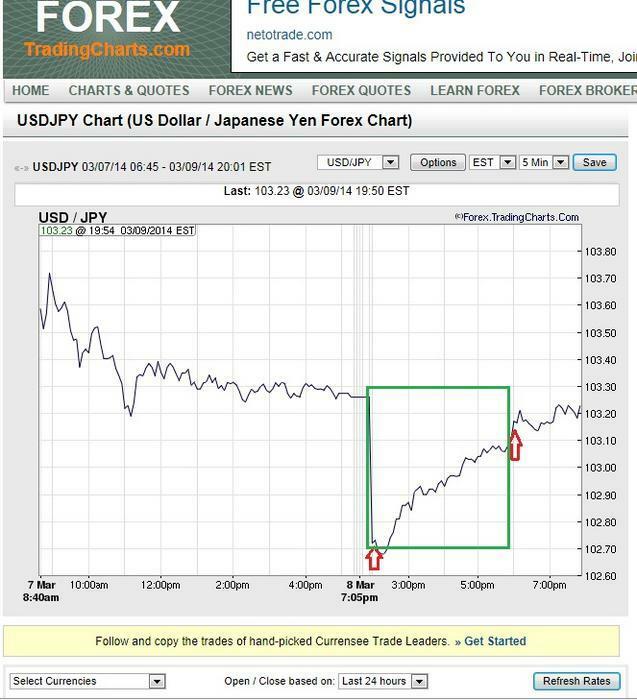 The dollar rose about 1% against the yen, and I was in the right direction, but then just before the big rise, there was a small drop and I suddenly just felt to get out. stopped my trades and a minute later this large rise happened. Now thats frustrating. Sometimes it really is best to just leave your trades alone and stop interfering. anyway - just a note to myself. Its one thing NOT to make gains when you had the direction wrong, but another to loose out even having the direction correct. 1/ Don’t have strict rules to follow, or any rules for that fact. 2/ Don’t believe 100% in your strategy to follow the rules. 3/ Still learning so experimenting. In which case you will undoubtedly loose or seriously reduce your capital sooner or later. This is something we have to go through to move up the ladder. We accumulate trading information – buying books, going to seminars and researching. We begin to trade with our ‘new’ knowledge. We consistently ‘donate’ and then realize we may need more knowledge or information. We switch the commodities we are currently following. We go back into the market and trade with our ‘updated’ knowledge. We get ‘beat up’ again and begin to lose some of our confidence. Fear starts setting in. We start to listen to ‘outside news’ & other traders. We go back into the market and continue to donate. We search for more trading information. We get ‘overconfident’ & market humbles us. We start to understand that trading success fully is going to take more time and more knowledge then we anticipated. We get serious and start concentrating on learning a ‘real’ methodology. We trade our methodology with some success, but realize that something is missing. We begin to understand the need for having rules to apply our methodology. We take a sabbatical from trading to develop and research our trading rules. We start trading again, this time with rules and find some success, but overall we still hesitate when it comes time to execute. We start trading again, this time with rules and find some success, but overall we still hesitate when it comes time to execute. We add, subtract and modify rules as we see a need to be more proficient with our rules. We go back into the market and continue to donate. We go back into the market and continue to donate. We start to take responsibility for our trading results as we understand that our success is in us, not the trade methodology. We continue to trade and become more proficient with our methodology and our rules. As we trade we still have a tendency to violate our rules and our results are erratic. We know we are close. We go back and research our rules. We build the confidence in our rules and go back into the market and trade. Our trading results are getting better, but we are still hesitating in executing our rules. We now see the importance of following our rules as we see the results of our trades when we don’t follow them. We begin to see that our lack of success is within us (a lack of discipline in following the rules because of some kind of fear) and we begin to work on knowing ourselves better. We continue to trade and the market teaches us more and more about ourselves. We master our methodology and trading rules. We begin to consistently make money. We begin to consistently make money. We get a little overconfident and the market humbles us. We continue to learn our lessons. We stop thinking and allow our rules to trade for us (trading becomes boring, but successful) and our trading account continues to grow as we increase our contract size. We are making more money then we ever dreamed to be possible. We go on with our lives and accomplish many of the goals we had always dreamed of. My trading, I feel is currently at number 36. I continue to learn my lessons from the market, but allow my system to direct my trading. There is no way to eliminate losing trades, but from a statistical standpoint letting the system work has proved to be consistently profitable. There is always room for improvement and I am always learning new things about the market and myself. Trader Jesse Livermore said it best,”A man may beat a stock or a group at a certain time, but no man living can beat the stock market.” Remain forever humble to the markets. Thanks for that. Interesting reading. reasonably happy with risk management - though still have some tweaks to my strategy. Its nice to see your account growing. You seem to be making consistent progress. Once your happy, are you going to post your strategy on babypips? I understand if you don’t want to. Just curious. yes - i dont mind posting my strategy - once i actually prove it to myself. and to that end I would have to say that I need around 100 days of continuous success. I am still suffering the indignity of my losses. But yes - when Im all good and ready, no problem.